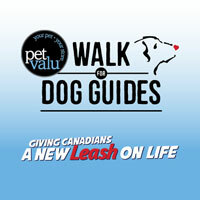 For $20.00 CDN you get to help a GREAT organization,The Pet Valu Walk for Dog Guides is a national fundraiser held in over 240 communities across Canada. The Walk raises funds for Lions Foundation of Canada Dog Guides, whose mission is to assist Canadians with a medical or physical disability by providing them a Dog Guide at NO COST. Dog Guides are provided at no cost to eligible Canadians, despite the $25,000 expense it takes to raise, train, and place each one. Lions Foundation of Canada trains Dog Guides and assist Canadians with a wide range of disabilities. With six programs in place, Canadians with disabilities are offered the opportunity to find greater independence, mobility and safety through the help of a Dog Guide. Depending on the program, Dog Guides are trained to perform a set of basic skills that are useful to all handlers. However, some of their training is also tailored to meet the specific needs of their future handler. In the final stage of training, the client and Dog Guide train and live together at the Oakville facility for two to four weeks. This helps to ensure that the new working team develops a bond and prepares them for their next step - returning home. You may fill out the form below and submit to convention committee to reserve your spot for the walk and ensure you receive your t-shirt when you arrive. Sign up for the City Tours and the Painting with Rick activities below. Fill out the form and click on the submit button to have your spot reserved for you when you arrive. You can pay at the convention to each activity you sign up for. Thank you for signing up for the City Tours, if times change before convention an email will be sent to you. The Lions Club of Winnipeg will have the information desk and all information on the tours when you check in. Thank you for signing up for Painting with Rick, You will receive an email to confirm your position or added to the wait list.